Every July, San Diego Comic-Con attracts thousands fans of comic books and science fiction and fantasy movies, TV shows, video games and literature. It also brings entertainment industry marketers hoping to connect with fans to produce the next mega-hit. Kendall Whitehouse, Knowledge@Wharton’s technology and media editor, recently returned from Comic-Con where he explored one of this year’s marketing trends. In the marketing arena that is Comic-Con International San Diego, the major Hollywood movie studios and television networks pull out all the stops to gain the attention of the 130,000-plus fans that descend on the city each July. The competition is fierce, pitting major advertisers against one another to have their message stand out amid all the clatter. At this year’s Comic-Con, several major companies hoped to entrance fans with immersive walkthrough environments that allowed them to interact with elements of a forthcoming movie, TV show, or video game — with hopes that sales will follow. The cadet training room in the Ender’s Game Experience. Photo by Kendall Whitehouse. 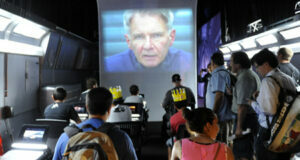 To promote the forthcoming science fiction film Ender’s Game, Lionsgate Entertainment offered the Ender’s Game Experience, in which participants entered a large temporary structure to view props and partial sets from the film. Visitors could sit in the cadet training room seen in the film as a video of Harrison Ford (as the movie’s Colonel Hyrum Graff) warned of the impending threat facing humanity. Perhaps the most elaborate of this year’s interactive environments was Legendary Pictures’ Godzilla Encounter, which occupied a 10,000 square foot building in San Diego’s Gaslamp Quarter. According to a spokesperson for the studio, the project took three months to plan and execute. The structure’s exterior was painted as if Godzilla had taken a swipe at the building. 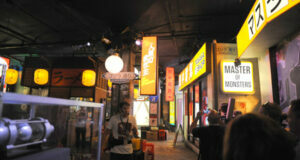 The interior was converted into the streets of Tokyo, with bright storefront signs, Godzilla posters and memorabilia, and a full-scale noodle bar. While visitors casually browsed this virtual environment, a warning sounded alerting them to the approach of a large creature. Everyone was shuttled into an elevator to escape to the roof. Once inside the large elevator, however, something seemed to go awry. The lights flashed, the room shook and the elevator appeared to halt in mid-transit. Emergency doors opened and the crowd was rushed into an office building where lights flashed and — seen out the window courtesy of a large LCD video display — the life-sized visage of Godzilla appeared. Offsite events are nothing new for San Diego Comic-Con. With the official Comic-Con programming extending beyond the confines of the San Diego Convention Center to occupy large rooms in the adjacent hotels, entertainment company marketing efforts cover much of the rest of downtown San Diego near the Convention Center. Beyond the official Comic-Con panel sessions, exhibit hall activities and celebrity signings, San Diego’s Gaslamp Quarter is filled with banners, professional “cosplay” (costumed character) actors, and company-sponsored parties. But, increasingly, this isn’t sufficient to stand out from the crowd. Marketing at Comic-Con has become an arms race, with escalating volleys of marketing tactics hoping to win the affection of fans. Last year, the one of the most visible examples of this marketing one-upmanship came from wrapping buildings with ads, effectively turning entire structures into huge billboards. While this approach was still in evidence this year — with the Marriott Marquis sporting a 10-story ad — unlike last year, the Hilton on the opposite end of the Convention Center remained unadorned. Marketing at Comic-Con has become an arms race, with escalating volleys of marketing tactics hoping to win the affection of fans. And this was not the first year to offer attendees a large-scale environmental experience. Many fans fondly remember the elaborate reconstruction of Flynn’s Arcade from the movie TRON at Comic-Con in both 2009 and 2010 to promote Disney’s TRON: Legacy. “TRON really started that trend,” said Comic-Con aficionado Tony B. Kim, founder the Crazy 4 Comic-Con blog. Despite the popularity of the offsite experience, when released in 2010, TRON: Legacy received a tepid response from critics. Time will tell whether these elaborate interactive environments pay off at the box office and the retail counter or, like TRON: Legacy, are remembered more for the marketing event than the product they are intended to promote. As Kim stated, “I don’t think anything will overcome a bad script or bad acting or bad storytelling.” Either way, marketers are sure to come out with guns blazing once again at next year’s Comic-Con.